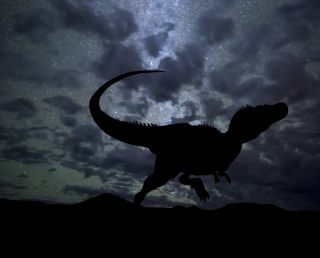 What would the night sky have looked like to a fierce T. rex some 67 million years ago? Sue, the world's most complete T. rex skeleton, resides in a recently renovated gallery in the Field Museum in Chicago. There, the fossil, named for their discoverer, enjoys a new immersive display that called on the expertise of not only the Field's paleontological experts, but also, perhaps unexpectedly, astronomers at the neighboring Adler Planetarium. The astronomical assist was needed because, as experts at Adler and elsewhere will tell you, the stars don't sit still. The ones we see all orbit the Milky Way, and they do so at different speeds and directions. So, over time, their relative positions change. In Sue's new, immersive display, which debuted in December 2018, that night sky appears on a set of six screens. In between animations demonstrating current scientific knowledge of Sue's behavior and environment, the exhibit refocuses the audience's attention on Sue's skeleton, with lights highlighting specific bones. During those periods, the animation screens turn to a night sky. To create that ancient sky, the museum turned to Mark SubbaRao, an astronomer and Adler's director of visualization, and Nick Lake, Adler's manager of theater experience and presentation. Lake drew on the Adler's night-sky modeling software, Digistar 6, which uses data from various satellite missions, including most recently Gaia, a European Space Agency observatory. Sue sports their newly added gastralia in front of Adler's star field. The software uses that data to build the most up-to-date 3D model available of the Milky Way stars, Lake said. But the software can also model stellar movement through the Milky Way over time. In a blog post, Lake shared a Digistar animation that rewinds the sky 150,000 years. "Even that relatively short period of time renders the Teapot in Sagittarius (a bright pattern to look for in the sky) and the Big Dipper unrecognizable," he said. Spinning the galactic clock back the 67 million or so years to Sue's time required the addition of a little art to Digistar's science, Lake said. Limitations in the measures of stellar positions and velocities compound over time, he said. Furthermore, the software doesn't account for the gravitational effects of two passing stars on one another. "Over the course of millions of years, [that] can have a huge effect on where that star is going to be," he told Live Science. In addition, stars move in circular orbits around the Milky Way, and over periods longer than about 5 million years, that curve becomes apparent. "That brings in a whole new set of dynamics that are just really hard to predict," Lake said. As a result, of those factors, no one can say exactly how Sue's sky would have appeared, he said. But modelers like Lake can project the motions of stars backward, seeking enough changes to our familiar sky to approximate a Cretaceous starfield. The Field Museum, Lake said, was "hoping to get not just a guess as to what they [the stars] might have looked like, but sort of an informed view," which is what his combination of Digistar modeling and curated observation provided. Lake paid special attention to familiar star formations that stuck together over long periods. For example, five stars in the Big Dipper travel together, so Lake followed trajectories back far enough to see the familiar patterns fall apart. "I wanted to get far enough beyond that so anyone with any sort of knowledge about the star patterns … wouldn't be taken out of the idea that this is a Cretaceous sky." He also looked for interesting patterns to emerge, so a human viewer (or, perhaps, a clever dinosaur) could pick out Cretaceous-era constellations. "The eventual starfield included an interesting clustering of fairly bright stars low on the horizon," Lake said in his post. "Slight clumping and clustering like that gives a lot of visual interest to the scene." Sue's new suite is packed with animations and renderings of the environments where dinosaurs this <em>T. rex</em> once roamed. Field Museum experts even worked with animators to ensure that the productions depict Sue leaving sufficiently muddy footprints. "Because this is an area that floods semi-frequently, we know the soil might be fairly soft," said Susan Golland, primary exhibit developer for Sue. The skeletal display itself includes scientific updates made since the fossil's 2000 installation. Sue now sports belly ribs called gastralia, and those (relatively) tiny forelimbs are now positioned more accurately, Golland said. Overall, the move to the new gallery put Sue in the right setting, Golland said. The tyrannosaur now resides within the museum's Griffin Halls of Evolving Planet, with the Field's other dinosaurs. "So, Sue is finally in the proper context," Golland said. And thanks to the Field Museum's colleagues across the way, that context extends all the way to the stars.